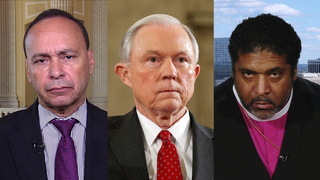 Black Democrats Say Testifying Last In Sessions’ Hearing Is Like Being Sent To “Back Of The Bus” | Democracy Now! On Wednesday, at the second day of confirmation hearings for President-elect Donald Trump’s pick to lead the Justice Department, Alabama Senator Jeff Sessions faced unprecedented criticism. But only one Republican on the committee remained to listen. If the others had stayed, they would have heard the voices we bring you today. New Jersey Democrat Cory Booker’s testimony marked the first time a United States senator has opposed a fellow senator’s nomination for a presidential Cabinet post. He was joined by Congressmember Cedric Richmond (D-Louisiana), head of the Congressional Black Caucus, who said the decision to have three black members of Congress testify at the end of the hearing was the equivalent of being sent to the “back of the bus.” We play the full comments made by civil rights legend Congressmember John Lewis (D-Georgia), who also testified Wednesday against Senator Jeff Sessions’s confirmation for attorney general. JUAN GONZÁLEZ: On Wednesday, on the second day of confirmation hearings for President-elect Donald Trump’s pick to lead the Justice Department, Alabama Senator Jeff Sessions, he faced unprecedented criticism—but only one Republican on the committee remained to listen. If the others had stayed, they would have heard the voices we bring you today. [In] New Jersey Democrat Cory Booker’s testimony, the first time a United States senator has opposed a fellow senator’s nomination for a presidential Cabinet post, he told the Senate Judiciary Committee that Sessions is unfit to become the next attorney general. SEN. CORY BOOKER: If confirmed, Senator Sessions will be required to pursue justice for women, but his record indicates that he won’t. He will be expected to defend the equal rights of gay and lesbian and transgender Americans, but his record indicates that he won’t. He will be expected to defend voting rights, but his record indicates that he won’t. He will be expected to defend the rights of immigrants and affirm their human dignity, but the record indicates that he won’t. JUAN GONZÁLEZ: That was Senator Cory Booker, who was joined by Louisiana Congressmember Cedric Richmond, head of the Congressional Black Caucus, who slammed the Senate Judiciary Committee, saying the decision to have three black members of Congress testify at the end of a hearing was the equivalent of being sent to the, quote, “back of the bus.” Behind him were other members of the Congressional Black Caucus. REP. CEDRIC RICHMOND: I want to express my concerns about being made to testify at the very end of the witness panels. To have a senator, a House member and a living civil rights legend testify at the end of all of this is the equivalent of being made to go to the back of the bus. AMY GOODMAN: The civil rights legend Congressmember Richmond was referring to is 14-term Democratic Congressman John Lewis of Georgia, who also testified Wednesday against Senator Jeff Sessions’ confirmation for attorney general. REP. JOHN LEWIS: Millions of Americans are encouraged by our country’s efforts to create a more inclusive democracy during the last 50 years, of what some of us call the beloved community, a community at peace with itself. They are not a minority. A clear majority of Americans say they want this to be a fair, just and open nation. They are afraid that this country is headed in the wrong direction. They’re concerned that some leaders reject decades of progress and want to return to the dark past, when the power of the law was used to deny the freedoms protected by the Constitution, the Bill of Rights and its amendments. These are the voices I represent today. We can pretend that the law is blind. We can pretend that it is evenhanded. But if we are honest with ourselves, we know that we are called upon daily by the people we represent to help them deal with unfairness in how the law is written and enforced. Those who are committed to equal justice in our society wonder whether Senator Sessions’ call for law and order will mean today what it meant in Alabama when I was coming up back then. The rule of law was used to violate the human and civil rights for the poor, the dispossessed, people of color. I was born in rural Alabama, not very far from where Senator Sessions was raised. There was no way to escape or deny the chokehold of discrimination and racial hate that surrounded us. I saw the signs that said “white waiting,” “colored waiting.” I saw the signs that said “white men,” “colored men,” “white women,” “colored women.” I tasted the bitter fruits, the bitter fruits of segregation and racial discrimination. Segregation was the law of the land that ordered our society in the Deep South. Any black person who did not cross the street when a white person was walking down the same sidewalk, who did not move to the back of the bus, who drank from a white water fountain, who looked a white person directly in the eyes, could be arrested and taken to jail. The forces of law and order in Alabama were so strong that to take a stand against this injustice, we had to be willing to sacrifice our lives for our cause. Often, the only way we could demonstrate that a law on the books violated a higher law was by challenging that law by putting our bodies on the line and showing the world the unholy price we had to pay for dignity and respect. It took massive, well-organized, nonviolent dissent for the Voting Rights Act to become law. It required criticism of this great nation and its laws to move toward a greater sense of equality in America. We had to sit in. We had to stand in. We had to march. And that’s why more than 50 years ago a group of unarmed citizens, black and white, gathered on March 7, 1965, in orderly, peaceful, nonviolent fashion, to walk from Selma to Montgomery, Alabama, to dramatize to the nation and to the world that we wanted to register to vote, wanted to become participants in the democratic process. We were beaten, tear-gassed, left bloody, some of us unconscious. Some of us had concussions. Some of us almost died on that bridge. But the Congress responded. President Lyndon Johnson responded. And the Congress passed the Voting Rights Act, and it was signed into law on August 6, 1965. We have come a distance. We’ve made progress. But we’re not there yet. There are forces that want to take us back to another place. We don’t want to go back. We want to go forward. As the late A. Philip Randolph, who was the dean of the March on Washington in 1963, often said, maybe our forefathers and our foremothers all came to this great land in different ships, but we’re all in the same boat now. It doesn’t matter how Senator Sessions may smile, how friendly he may be, how he may speak to you. But we need someone who’s going to stand up, speak up and speak out for the people that need help, for people who have been discriminated against. And it doesn’t matter whether they are black or white, Latino, Asian American or Native American, whether you’re straight or gay, Muslim, Christian or Jews. We all live in the same house: the American house. We need someone as attorney general who’s going to look out for all of us, and not just for some of us. AMY GOODMAN: Civil rights icon and Congressmember John Lewis testifying Wednesday against the confirmation of Senator Jeff Sessions as attorney general of the United States. That does it for our show. This weekend, I’ll be in Vermont. On Saturday, I’ll be having a public conversation with 350.org founder Bill McKibben at the Chandler Center for Arts in Randolph, Vermont, at 7:30. Monday morning at 10:00 a.m., Martin Luther King Day, I’ll be at University of Michigan, Ann Arbor, with actor Issa Rae to give the Memorial Keynote Lecture at Hill Auditorium. Next Thursday, January 19th, I’ll join performers Solange, Esperanza Spalding, activist Angela Davis, writer Alice Walker, actor and activist Danny Glover and many others for the 2017 Peace Ball, takes place at 8:00 p.m. at the National Museum of African American History and Culture. Check out democracynow.org.